Thank you and you did an awesome job!! We had hired a magician last year, who was new to your industry. We assumed that most magician are the same and we would save money, what a mistake that was. Your performance was absolutely wonderful and I know that the kids and adults alike thoroughly enjoyed your magic act. The birds were beautiful and Rex the rabbit was so adorable. In fact, I was told by many of the children's parents that they will be calling you for your magic show in the future. Thanks Again. Magician Jaime Aponte was perfect for our daughter's birthday party. He mesmerized our guests with his magic, which really made for a terrific evening. We'll definitely have Jaime back at one of our events. We were all extremely impressed with his presentation of magic for our costumers at our branch grand opening - Chase Bank, Chicago. What a great added attraction you were at my son, Andrew's graduation. The close-up magic was amazing. Thank you for being there and adding many magical moments. The kids are still talking about your animal show and how much they enjoyed it. Thank you so much again and I hope we get to work together again in the future. Jaime was wonderful! The wedding reception was such a hit!!! Having him do Strolling Magic at our wedding was such a great idea, he blew us all away!! People are still talking about it!!! It was such a treat to see our guest and families smiling and laughing, and his magic help create the perfect atmosphere and some great memories for us. Thank you again for making our block party great. Without you there it would have been uninteresting. Your illusions were fantastic and everybody loved all the animals (Birds, Snake, and the Bunny). I'll come right to the point about Jaime Aponte, save yourself the time of looking around, hire him. I have never seen a magician of with his skills, comedy and the ability to mesmerize his audience. Ella Dryver, 7, of Northbrook, waves a wand during Jaime Aponte's magic show at the Northbrook Park District Carnival on Friday, July 31, outside the Northbrook Leisure Center. Northbrook's Annie Hamilton reacts as Jaime Aponte hands her a snake in one of his magic tricks. Jaime was wonderful to work with from beginning to end. He kept the crowd engaged the whole performance. Every child and adult enjoyed his show and he involved everyone in the performance. He even did tricks for children as they were waiting for the show to start. I would definitely book him again and suggest him to friends!! Mark your calendar for the rest of the Little Bearfoot Concert Series, a July Thursday morning offering by the Glenview Park District in The Glen. The Little Bearfoot Concert Series began July 7 at the Gallery Park Amphitheater, just northwest of the Park Center, 2400 Chestnut Ave., behind Attea Middle School. "(Magic) keeps them in touch with their imagination, and who doesn't like magic?" Juricic said. "Anything is possible." Children from a summer explorer day camp and families attended Aponte's hourlong presentation. "I think it's pretty awesome and pretty amazing we have opportunities like this," said Jill Runtz of Northbrook, who brought her children, Timmy Runtz, 4, and Scott Runtz, 2. 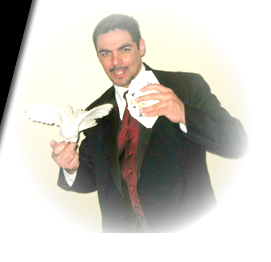 Aponte describes himself as a "traditional magician" who specializes "in magic for entertainment to all ages." Aponte uses animals such as doves, rabbits and a 3-foot male red tail boa constrictor named Samson in his show. "It stimulates the senses of children when they see animals," said Aponte, who encourages kids to help magically make the animals appear. "It's important for them (youth) to feel like they're making the magic happen," he said. Organizers of Northbrook's Autumnfest say as the weather changes from hot and humid and hints at the approach of a crisp, chilly breeze, they hope Northbrook residents will get in the mood for fall. The free family festival, now in its seventh year, takes place on Saturday, Sept. 26, from 2-6 p.m. at Meadowhill Park, 1479 Maple Ave., in Northbrook. "The best thing about this park district event is that it brings the community together outdoors, before cold weather arrives," The main stage entertainment will feature Chicago magician Jaime Aponte, also known as J-Magic, will put on a show of illusion, magic and comedy said Tiffany Greene, a leisure services supervisor with the Northbrook Park District. Mark Doetsch, president of the Conjurors Corner Magic Club, reaches into a black bin and pulls out the names of nine magicians in the order they'll perform in a few minutes during the club's annual magic competition. "The hardest thing to do is perform magic in front of other magicians," We're all different characters and we all present magic differently," says Jaime Aponte, a veteran Chicago magician who makes live birds, rabbis and a snake appear during his act. "We support each other."